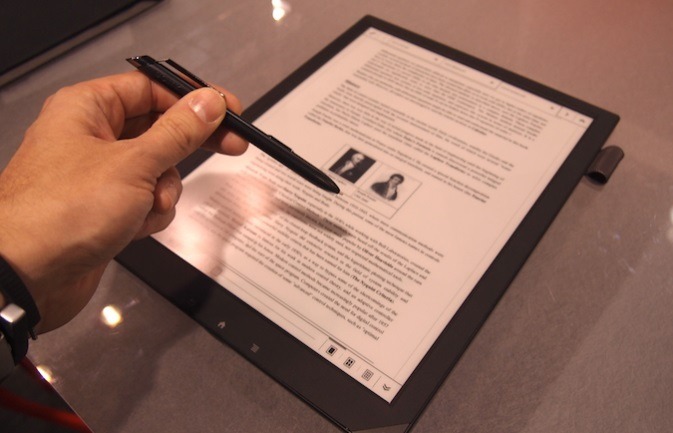 Today Sony has begun to sell the DPT-S1 Digital Paper e-reader directly in the US. It is retailing for $1100, which is more cost effective than a few of their official distribution partners. The only catch, is that they don’t want to sell them to the average consumer. When calling the brand new Sony Business phone number you are basically interviewed. It is mandatory to open up an official Sony Business account and they stick with you on the phone while you receive confirmation emails. The few customer service reps Sony employs are mandated to vet prospective customers to insure they have a high level of technical knowledge and are a registered business. Corporations, LLC and sole proprietorships have the highest likelihood of being able to order a few units for themselves or co-workers. The average user will have to demonstrate that they have advanced knowledge of e-readers and won’t be bothering Sony with needless questions. If you are an established company looking to buy a few Digital Papers for your business you can call the new phone number Sony launched today. 877-723-7669 Monday through Friday 8am to 6pm. It is important to note that they offer free next day shipping via FEDEX anywhere in the USA, but will not ship internationally. Good e-Reader will have the Sony Digital Paper e-Reader in our studio next week. Expect a very comprehensive hands on review, unboxing and comparisons with other large screen e-readers on the market. Would appreciate if Good-E-Reader thoroughly investigates how well this device acts as an internet “monitor”. My eyes get sore and red after ~10 minutes on any LCD monitor and if I could instead efficiently browse on an eink monitor, then perhaps the $1100 would be justifiable in order to save my eyesight. Do you already use a monitor without the PWM effect? If not try upgrading to one without that pulsing effect and you may have an easier time for long term reading. If that still doesn’t help I’ve heard Gunner optiks will work.